so it is time for a little cleaning and a refreshing fresh start to the season and we have 8 brand new cocktails ready to hit the menu! The New Year is here and LOVE is in the air! Valentine’s Day is approaching fast and reservations are already calling in! Click here to make your reservation online. Chef Rojas’ specials will be available Thursday, the 14th through Saturday the 16th. We have special holiday hours this season. The specials below will be available both evenings. Thank you to everyone who attended our Rosé Social this past Thursday! There was a topic of discussion among some guest about Rosé and the differences in color among the varying styles and varietals. Food and Wine posted an article today that some people may find interesting so I thought I would share it. A heartfelt congratulations to all college graduates! We would like to extend our congratulations to all Bradley University and Illinois State graduates. On May 12th, we will have modified hours and be open 11:00 am to 10:00 pm to celebrate with you and your families! We will be serving our full dinner menu all day long. Our new Menu is live! Over the last several months, we have been tirelessly working to give Two25 a much needed upgrade and change. With the addition of the new lunch menu and wine list in January, as well as a revamped cocktail list, we are striving to bring you the best selection Peoria has to offer. We aren't done yet though so keep your eyes on the look out for a new dessert menu and a gallery of all of the new dinner items! Two25 is participating in the Dream Center's Soup and Soul event this year and we will be serving a Cream of Mushroom and Truffle soup. The event is Tuesday, February 27th from 5:00pm to 7:00pm. Tickets are $10 and directly benefit the Dream Center. Click here to buy tickets! Soup & Soul raises money to fund the various programs and events at Dream Center Peoria, and your involvement helps make it possible for us to do what we do. Most importantly, this night helps us connect with people in this city who want to make an impact on families living in poverty, starting with kids and youth. Love is in the air! Do you have a reservation yet? Two25 is now hiring for all positions. If you are interested please stop in to speak with one of our management team today about the job opportunities that Two25 has to offer. After several months of tasting, planning, and evaluating, we are pleased to announce two wonderful additions to Two25! The first is the addition of nearly 40 bottles of wines to our list. We now offer over 70 wines in a wide price range. The wines come from over 11 countries and offer something for many different palates. From classics such as the Taittinger Brut la Française to the new, rich blends from Napa Valley, like Paraduxx and Papillon, our list tries to find a balance with everything in between. In addition to the new list, we have added a new piece of furniture. 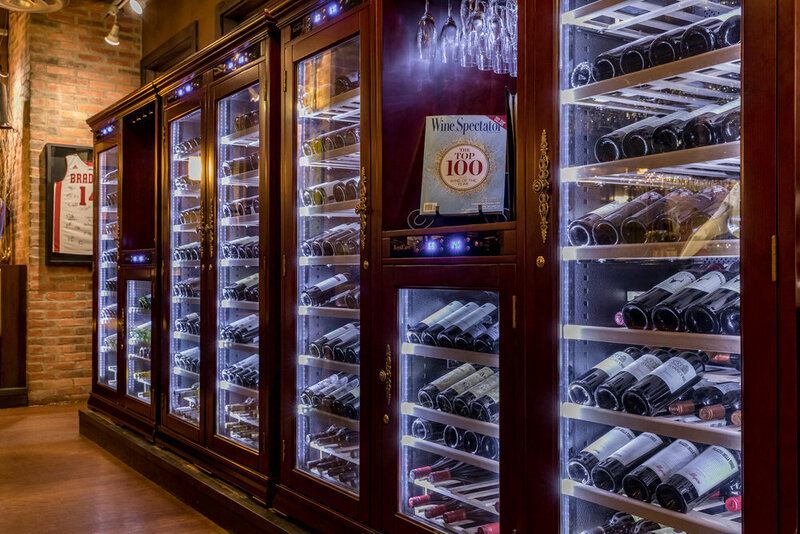 Holding over 1000 bottles at a time, our new wine cabinets are both temperature and humidity controlled. This allows us to serve our bottles at the perfect temperatures and maintain the integrity of the cork. Stop in soon to see what the new list offers today! After a few technical issues our new website is live! You can expect new content often as we add galleries of our menus and pictures of the restaurant. We will also add an events page where you will be able to see all of the upcoming special events we have scheduled! The news tab will also be a great spot for you to learn more about what we offer every week. Specials will be published and any new additions to our menus will be published here!